How Do You Measure If Evangelism Is Working? Worst case scenario someone walks away having had a polite discussion with someone who is friendly and willing to listen. Ok… But where’s the payoff? What are the results? The bottom line. What numbers are you bringing in? How much more is in the offering plate? When an atheist comes up to me and he hears that God is not waiting for him to make the first move… or the second move… or any move at all, but rather that Jesus has done it all for him already and God was in Christ reconciling the WORLD to himself, not counting men’s sins against them. This is the outrageous Word of God. You can’t unhear the Gospel. Once you have heard it you know the message is different from any other message you have ever heard before. Jesus is unique and so is His message. So once you have heard it, it stays with you and in the face of mortal struggles promises peace in our shattered lives. Atheists are confounded. In one situation at the end of our conversation, the student, a self-proclaimed atheist, slowly walked away, and every few feet he turned back to look at me and said, “ I don’t believe what you said, but I have never heard it before.” He was stunned. So there it is, he heard something new. God is doing something new. He is the one who changes us. And He does it through His Word. And there is no promise that we will see the results. Even an atheist set in his ways will be shaken by the love of Jesus that has no end. A Muslim man saw my box that says, “Religion is for the weak” and after reading it he became furious. Shaking, his face hot with anger, he asked me why I had this sign. So I told him that I was weak, that I was going to die and that I am guilty. At this point he began to calm down. He saw that he could relate to me and he then understood the sign. I asked him if he feared judgment, and he told me that he did. Then I told him that he did not have to worry, because Jesus had already taken his punishment. I said I was afraid of death. He said he was too. I said I was afraid of judgment. He said he was too. I said not to worry about judgment because Jesus has paid for his sins. He told me that this was intriguing and that he did not know that Jesus was free or that the resurrection was testable. He thanked me for giving him important ideas to think about. One of my buddies named Victor, a Russian Jew from UCI, meets with me regularly. And though he claims he does not yet believe, he understands clearly that Jesus paid it ALL and he is able to sniff out works derived theologies. He understands that good works do not make a good man, but a good man does good works. We all began by hearing the truth, and then speaking the truth and believing the truth. That truth came to us on the lips of another. As Jesus said in Luke 24, repentance and the forgiveness of sins will be preached. And that is what we are doing. People are hearing, and God is doing His work. He is faithful. Yes, it is true that we don’t always get to see what He is doing but we do get glimpses. 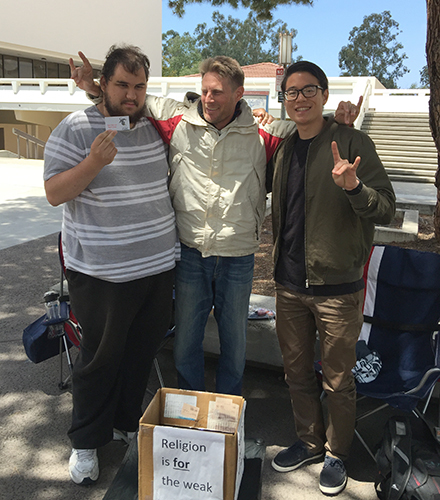 Our message, boldly declaring, “Religion is for the weak,” drew in yet another curious student, that bright spring afternoon at California State University San Marcos. As is usually the case, he questioned the meaning of our sign, posted, in bold font, on four sides of a simple cardboard box. Our small group, usually two or three, is learning to postpone our answers until the inquirer is encouraged to express their opinion about the announcement. Responses vary tremendously and give us a hint as to how we might eventually answer their question. In this case, there stood before us a very outgoing and athletic young man, named Jason, with an easy smile and much to say. Generally, he voiced an upbeat live-and-let-live philosophy over the course of ten to fifteen minutes, intermittently acknowledging our perspective and even, to some degree, weaving it into his own. Unexpectedly, he initiated a change in the tone of our visit by asking if he could sit down. Upon seating himself, he spoke to us on a more personal level indicating he had a story to tell. He unfolded before us a portion of his life admitting that he had grown up a well-traveled, yet spoiled brat from Orange County whose mother and stepfather eventually kicked him out of the home early in his college experience. Suddenly he was homeless and his track and field scholarship was toast. Bouncing around from roommate to roommate compounded some harsh life realities. They stole his little food and yet denied him a key to the apartment. Apparently, he looked so obviously discouraged as he sat outside their building, trying to figure out what to do, that he attracted the attention of a passerby who took the time to inquire about his well-being. Initially Jason minimized the depth of his dilemma but the middle-aged man “Rich,” was sincerely concerned and encouraged the young man to unload his burden. Rich listened, talked, and referenced his own son. Before leaving, the gentleman said he had a spare room not far away and that Jason was welcome to bunk down as needed. Though Jason turned him down in favor of another roommate arrangement, that opportunity fizzled as well. It was not long before the young man was at Rich’s front door, ready to accept help. Room and board were freely offered without expectations except that Jason get back in gear with school, track, and a part-time job. Before long, Jason insisted on paying rent and occasionally cooking a steak dinner for Rich. He took pride in telling us that now he pays substantially more for rent, not wanting to take advantage of his benefactor. Soon, Rich, a non-Christian, and Jason had frequent “evening chats” which eventually led to Jason reconnecting with his own long-absent father, as well as his mother and step-father. He even said Rich was like a father to him. While Jason plans to become a physical therapist, he has a bigger plan. He wants to write about what Rich has done for him. His face colored with obvious emotion at this point as he passionately expressed his profound gratitude for this man’s influence in his life. While his comment gives me hope that the Holy Spirit is not done with him yet, the important thing is that Jason reminded me that those truly touched by life-changing goodness cannot help but be witnesses. God used two non-Christians to reinforce me this truth, inspiring me to continue with college campus witnessing for Jesus Christ.